As our site and property portfolio expands we will be adding places which we think are of interest, this is by no means an exhaustive list, just a little helper for you. 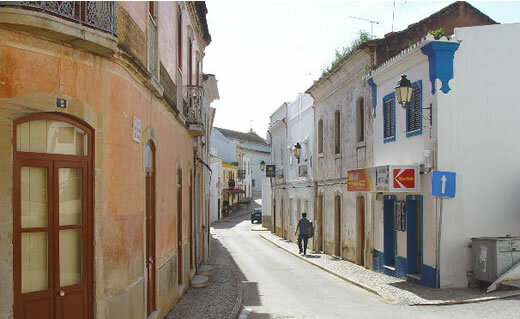 Alcantarilha is a town that for many years I have driven past on the N125 which was formerly main road to get to the West of the Algarve. Recently I have taken the advice of many who live in the area and visited this charming town. Alcantarilha became a town in 1999 when its official population reached 3000 people. Alcantarilha is soaked in history. 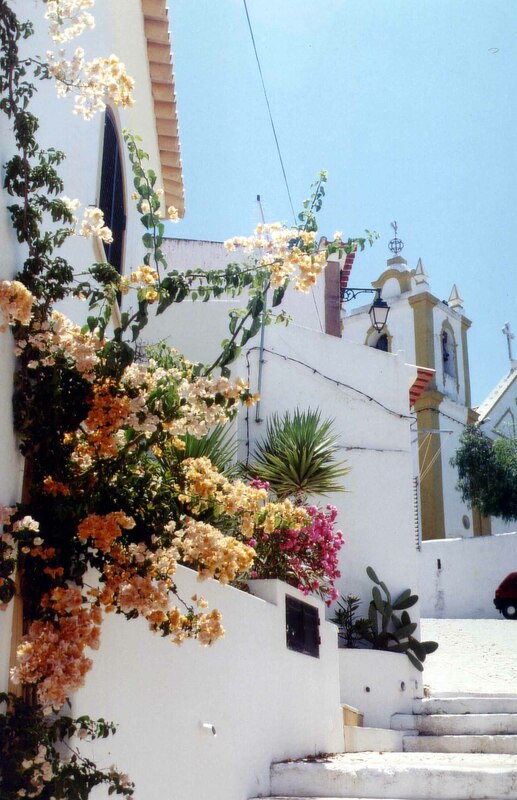 Alte is probably one of the most picturesque villages in the central Algarve countryside. There is no sense of time while you stroll around the back streets of the village. The views are breathtaking. Of particular interest are the natural springs and 16th century church. There are a couple of picnic spots close by. 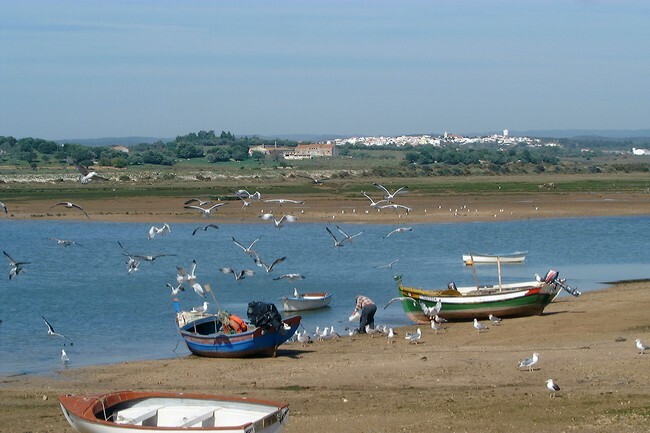 Alvor sits next to the river estuary on sand banks. 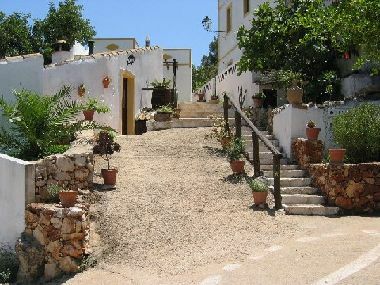 Consisting of mainly low houses, the cobbled roads lead down to the sea. 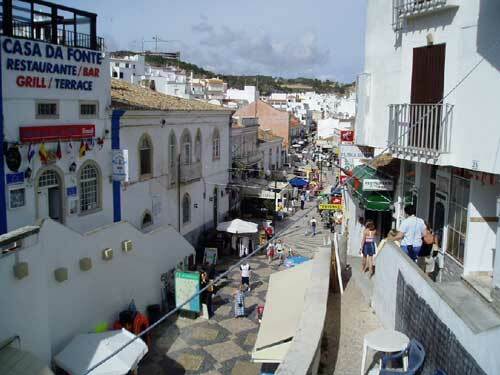 Alvor is very much a fishing village, and although more tourists visit there now, it is still a quite village with bars, restaurants and shops. There are nice long beaches to walk along and enjoy a relaxing holiday. The old town of Albufeira is delightful with the odd Moorish relic. By contrast if you were looking for a holiday where you could be anywhere in the world, the more well known side of Albufeira is full of loud bars, restaurants and shops and is heaving in high season. Not my cup of tea, even when I was younger. Although there is an extremely good nightclub nearby called Kadoc - yes you may remember the tune the "Night Train"
Almancil has become an important and busy town over recent years as it services both the popular resorts of Vale De Lobo and Quinta Da Lago - both famous for their golf courses. It has a good number of restaurants and is also well known for its pottery and ceramic tiles. A small village revolving around its church. Small cobbled roads and planted jacaranda trees give shade in the summer heat. The area surrounding Caldas is full of fonts where locals and tourist can bottle their fresh drinking water. The village is extremely beautiful with an art and craft centre and a square to sit and relax, having a drink and a meal. A walk up from the centre takes you up past a stream and various fonts, like the Font of Love, a sip and maybe love will come your way. 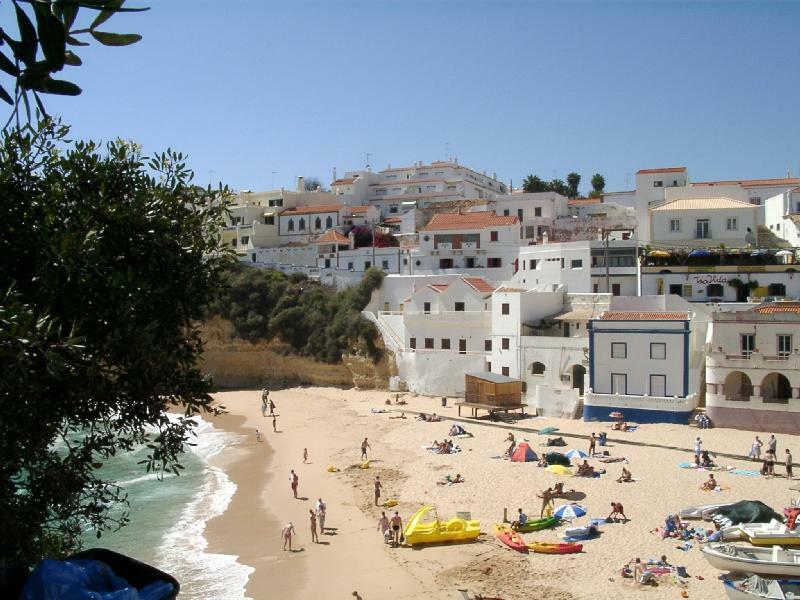 Carvoeiro is a lively fishing village which has become popular during recent years, but still retains its local charm. The fishing boats come and go and fresh fish and locally produced fruit and vegetables can be purchased from the market. 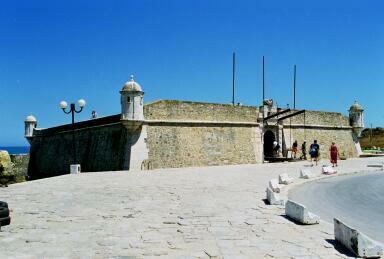 Many associate Faro with the airport, but it has so much more to offer. The old town has cobbled streets and lots of history. There are lots of shops and places to eat. Faro has a surperb beach that appears disconnected from the mainland. 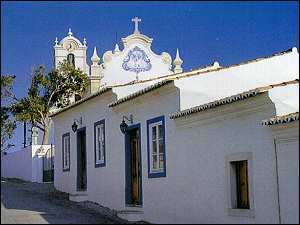 Faro is now the capital of the Algarve. This small unspoilt Portuguese fishing village is situated on the east bank of the Portimao river, where village life revolves around the quayside square. In the summer months it is decorated with garlands, fairylights and a stage where live acts and bands perform on weekend evenings. This is a place of beauty, an attractive beach backed by sand dunes and a nature reserve behind. Unlike the beaches around Gàle it is quiet all year round. Just walking there you can feel a sense of peace and relaxation. The Salgados 18 hole golf course lies alongside it. If you are interested in this area, try staying at Casinha Cullenagh. 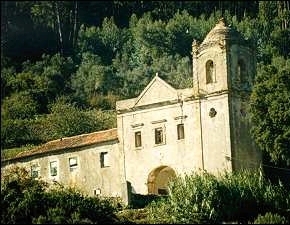 This is where Portugal´s Age of Disovery started in the 15 Century. Also pictured is the fort used to bring slaves in and out of the country. There are lots of places of interest here new and old. A lot of money has been invested in Lagos with its new Marinha. Every 1st Saturday of the month is market day. 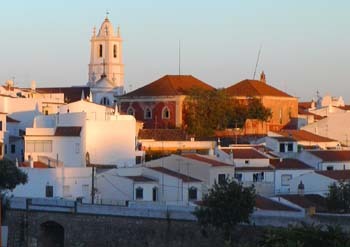 Loulé is one of busiest inland towns in the Algarve. Castle walls near the centre of town are reminders of Roman and Moorish occupation. The parish church is 13th century Gothic. 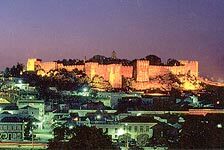 This is the old capital of the Algarve and very much one of my favourite towns. 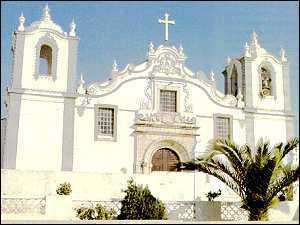 Its sits at the foot of the Monchique mountains. Surrounded by history, the long walk up to the Castle is well worth is for the views.